Owing to the significant proliferation of cloud, IoT, machine learning, and artificial intelligence, service robotics market has been treading along a lucrative growth path in the recent years. Apparently, it has to be noted that robots have been around since the 1960's. However, the definition of the 'standard' robot has evolved immensely and the technology has now emerged as one of the most transformative fields of innovation. Service robots have increasingly acquired a momentous position as a vital interface between service and industry sector. Moreover, service robotics industry has been garnering overwhelming business opportunities from a plethora of business verticals including logistics, defense, household, entertainment, and healthcare. In fact, as per reliable estimates, the global service robotics market accrued a massive remuneration of over USD 8 billion in the year 2016. Elaborating on the technological intervention in service robotics industry, the healthcare applications of this business space have been gaining vigorous momentum in the past few years. For instance, one of the most acclaimed service robotics market player Intuitive Surgical has recently announced to have received Food and Drug Administration’s clearance for its da Vinci X Surgical System. Apparently, the latest system provides surgeons with access to one of the most enhanced robot-assisted surgery technology at the lowest cost. Moreover, the system enables optimized focused-quadrant surgical procedures such as benign hysterectomy, prostatectomy, sacrocolpopexy, and partial nephrectomy. Apparently, industry experts speculate that the introduction of such groundbreaking technologies is bound to favorably impact the product landscape of service robotics industry in the ensuing years. 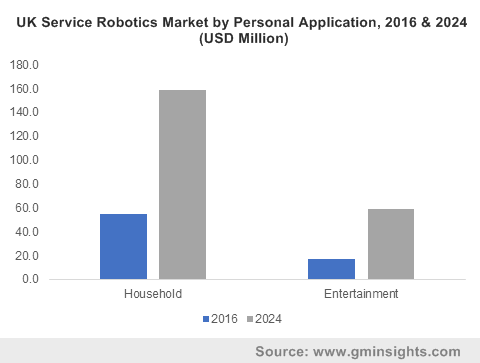 The presence of a robust and advanced research infrastructure coupled with the rising demand for automation across a range of business verticals has fostered the United States service robotics market expansion in the recent times. Moreover, numerous government agencies in the nation have been investing massively in the latest robotics technology in order to ensure security and safety of its citizens. Citing an instance of the humongous investments being made by government agencies in breakthrough technologies, the U.S. Defense Advanced Research Projects Agency (DARPA) has been reportedly spending as much as USD 3 billion annually to fund its robotic research programs. It would be prudent to mention that DARPA has been aiming to manufacture high-grade combat/military robots to cater the escalating demand from US Army as it has been striving hard to increase the number of soldiers. This has, in turn, assisted the service robotics industry participants to gain numerous business opportunities from the government contracts and other research initiatives. In addition to this, it has been reported that in early 2018, the US Army conducted a live-fire exercise by utilizing a fully automated machine gun and a remote-controlled ground combat robot. The demonstration is apparently being described as revolutionary in the service robotics industry, given that the Army had deployed a ground robot for the first time to provide fire power in tandem with human soldiers. Furthermore, as per a few trusted sources, it is being claimed that the US Army would consist of more combat robots than human soldiers by the year 2025. Moreover, the defense budget of United States has witnessed an astonishing jump in the past few years. For instance, the Pentagon is said to have been armed with a fund allocation of more than USD 700 billion for the next few years to develop advanced technologies in order to effectively tackle the ever-increasing terror threats and security violations. Needless to mention, a significant portion of the budgetary allocation would be directed toward developing combat robots – a factor that would further impel the growth prospects of US service robotics market. Speaking of the competitive landscape, service robotics industry encompasses some prominent firms along the likes of Samsung Electronics, AeroVironment Inc., Parrot SA, Bluefin Robotics, 3D Robotics, Intuitive Surgical Inc., Softbank Robotics, and 3D Robotics. Considering the aforementioned aspects, it is quite imperative that these organizations are increasingly focusing on manufacturing technologically enhanced robots with pathbreaking functionalities. Moreover, it has been observed that these companies appear keen on tapping into the power of robotics for providing better consumer service which is certain to propel the global shipments of service robots. In fact, as per a research report compiled by Global Market Insights, Inc., the service robotics industry is forecast to register an impressive y-o-y growth rate of 20% with regards to worldwide shipments over 2017-2024.